Grace – What’s So Amazing About It? Grace nurtures hope. This past week has been one of the most difficult weeks in Texas. Never in the history of tracking weather, has major flooding from heavy rain occurred in Houston, Austin, Dallas, and San Antonio – at the same time. Raging rivers have destroyed communities and shattered lives. 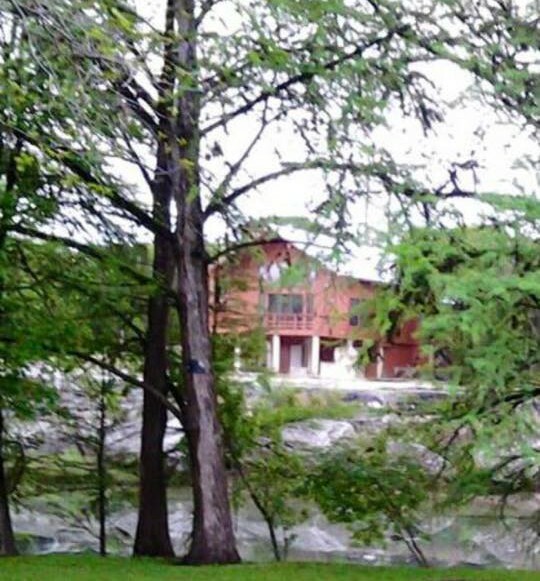 The most tragic of these is the loss of life due to the Blanco River rising so quickly that a vacation home was literally swept of its piers before the occupants had a chance to escape. Of the 8 people in the home, 5 have been found, 3 remain missing. Of the 5 found, only one has survived. Jonathan McComb was found 12 miles down river from where this house once stood. You can see this is not a small cabin by the river. All that remains are the concrete piers you that supported the deck. As this house floated down the river, Laura McComb called her sister to say the house was floating down the river, and basically said good-bye just before the house smashed into a bridge sending the occupants flying. My friend Karen posted this on Facebook today. We waited 20 months for a Pastor. While I loved Joe, we needed a full-time Pastor. At times discouraged with the time it took, but God in his infinite wisdom and knowledge knew what we needed. He has never failed us. It was well worth the wait! So deeply thankful for Brian Hill (the new pastor). You stepped into our lives in God’s perfect timing. God placed Jonathan McComb on the search committee and you got to know him and Laura and the kids. Now, your compassion is helping us all walk this journey. Thank you and God Bless you! Hope is the one thing that keeps the light on in our soul when our circumstances tell us otherwise. Hope is putting a positive spin on the situation no matter how bleak it may be. Without Jesus in our hearts, that is impossible to do. When tragedy strikes, we have two choices. We can let the tragedy dictate our perspective or we can hold on the Rock of Jesus and trust Him to bring us through the tragedy. And we can only do that if we know Jesus personally, just like a friend. Jesus calls you His friend (John 15:15). Can you call Him your friend? When tragedy happens, you need a friend like Jesus. Do you know Jesus in your heart? If you do, then you have the grace that nurtures hope. If you don’t know Jesus in your heart, then perhaps now is the time to do this. Believe in the gift of salvation. Pray to confess your sin. Receive Christ into your life. What’s keeping you from asking Jesus to be your friend today? Today, May 24, 2015 is Pentecost Sunday. While Pentecost Sunday is not celebrated as well in Christian circles as Christmas and Easter, it is a significant date Christians should remember because 50 days following the passover celebration, the Holy Spirit came down from Heaven like a rushing wind and transformed Jesus Christ’s followers. Pentecost literally means 50th day which is used as a measure throughout the Old and New Testaments. The most common use sets the date of the Feast of Pentecost also called the Feast of Weeks, the Feast of Harvest, and the Feast of The First Fruits. In the New Testament, Pentecost is better known as the Day of Pentecost and is considered by some as the birth of the Christian Church. I like to think of it as the day that transformed the early Christian Church. The Apostle Paul explained God’s Grace in his letter to the Christian Church in Rome. God’s promise to Abraham is spelled out in Genesis 12. Abraham and his descendants received the promise that they would get the whole world. He did not receive that promise through the law, but through being right with God by his faith. 14 If people could receive what God promised by following the law, then faith is worthless. And God’s promise to Abraham is worthless, 15 because the law can only bring God’s anger. But if there is no law, there is nothing to disobey. And God’s promise to Abraham was repeated in Genesis 22:18 after God tested Abraham’s faithfulness. Following the last Passover with His disciples, Jesus promised them they will not be abandoned. The disciples’ faith was tested for 50 days before the Day of Pentecost. Until the Day of Pentecost, Jesus’ followers did not know how to follow through on Acts 1:8. They remained together in Jerusalem as Jesus instructed them and waited for the Holy Spirit. The people in Jerusalem saw the transformation the Holy Spirit brought on the disciples. The same Peter who had denied Jesus some 50 days before, delivered the Gospel Message (Acts 2:15-40, NCV) with boldness and authority, just as Jesus said he would be able to do. As a result, 3,000 souls were saved by Grace that day. What’s so amazing about Grace? Grace changes everything. It all starts with salvation. There are no “magical” words that result in salvation. Salvation comes to those who believe the truth of John 3:16. Salvation cannot be earned, it is a gift from God. Salvation is as simple as A B C.
ADMIT that you need Christ as your savior, and that all those who call on the Lord Jesus and obey Him will be saved. You can’t be saved without Him, nor add to or take from what Christ has done for you (Romans 3:23, 5:8, 6:23). BELIEVE the Lord Jesus Christ is the Son of the Living God. You can know He is Who He says He is by the hundreds of prophecies that came true in His Life. Many things foretold hundreds of years before His birth came true in His lifetime, and others, He Himself made, came true later (Romans 10:9, 10:10). CONFESS to the Lord and admit to yourself that you have responsibilities and that you have commitments as a believer and follower of Jesus Christ. The more you know about the Lord Jesus Christ, the more you’ll want to tell other people about Him (Romans 10:13, 11:36, John 1:1). I would love to hear your story about how Grace changed you. Recently, I’ve read some comments to my Facebook friends’ status updates that made me wonder, how in the world can someone be so bitter and angry at life? Then it hit me. I am not a trained psychologist, psychotherapists, or counselor of any kind. I am not a Bible scholar nor a theologian. I only offer my opinion based on my personal experiences. 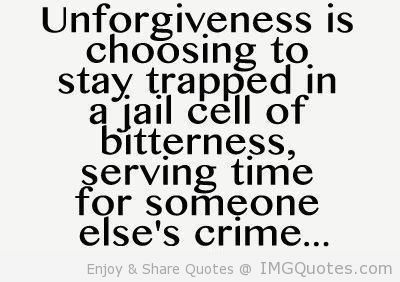 Unforgiveness is cancer of the soul. It will eat away at you and destroy your life. It is a spiritual poison and silent killer. Once unforgiveness takes root, it silently grows and takes over your entire being. God promised sickness and illness to fall on the Israelites when they chose to not follow Him in obedience. I have seen bitterness and anger that seem to permeate generations. God also promised a cure for this. Unforgiveness is deadly. We can choose to live a life rooted in bitterness and unforgiveness or we can choose the opposite and live a life filled with the richness of God’s Grace. Remember – Grace Changes Everything. It all starts with forgiveness. WOW! That’s tough. Yes it is, but it is possible – with God’s help. Many of us learned to recite The LORD’S prayer as a child. But do we really understand the words we say? You CAN break free from the grip unforgiveness has on your life. But you cannot do it alone. You can only do it after receiving the free gift of Grace because Grace changed everything. Satan will remind you that you are not good enough for Jesus. He will remind you that your past cannot be forgiven. When this happens, tell Satan that the Jesus who defeated him on the Cross is the same Jesus who has removed the bitterness and unforgiving spirit from your life. Remind Satan that you are now a Child of the King and he has no authority over you! Have you been changed by Grace? If so, I would love to hear your story. If not, do you know Jesus personally just like you know your spouse, child or parent? Anyone who calls on the Lord will be saved. The choice is yours. We live on a point on the continuum of time called the Present. We cannot do anything to change our past however we can control our future. As we travel from place to place, it would be crazy to think we load the car and begin a trip without knowing the destination. Yet that is exactly how many live their lives. In 1996, Linda Ellis wrote a poem titled “The Dash“. The poem is about a man who spoke at a friend’s funeral. How are you spending your dash? Aimlessly? Or with vision? Do you have a vision? Is it Grace driven? Use the gifts God has given me to make a difference in other people. God gave me that vision just before He gave me my last full-time the job at Driscoll Children’s Hospital in Corpus Christi. I knew this job was going to be different from any that I had before. How did I know that? Because Graces changes everything. When Jesus comes into your heart, you become a vessel where God can pour out His blessings. In a large house there are not only things made of gold and silver, but also things made of wood and clay. Some things are used for special purposes, and others are made for ordinary jobs. 21 All who make themselves clean from evil will be used for special purposes. They will be made holy, useful to the Master, ready to do any good work. How do we delight ourselves in the Lord? By doing things that please Him. That is my 1st vision (Glorify God in all things I do, think and say). And doing things that please Him can only happen if you know Him in a real and personal way. Jesus Christ, the Son of God, came into the world as a human being, lived a sinless life, died on the cross and rose from the dead to save humanity from dying in their sins. Christ died to pay for our sins, your sins can be forgiven. And because He conquered death, you can have eternal life — you can know for sure what will happen to you after you die. God has a plan for you but cannot reveal it to you until you have receive Jesus into your life. Let today be the day that you receive Jesus and let today be the day that Grace change everything. Grace – What Is So Amazing About It? Trevor McKinney’s 7th grade social studies teacher, Eugene Simonet, gave the class an assignment – Do something to change the world. Trevor decided to do something really big for three people who need it with the stipulation that they do something big for three others. The October 2000 movie, Pay It Forward, spawned the Pay It Forward Foundation and in 2007, Pay it Forward Day was founded by Blake Beattie in Australia. Grace does not depend on the recipient doing something as a condition to receive Grace. A better example of Grace would be paying for the order of the person behind you who is in line at the drive through of a fast food restaurant. The recipient does nothing to deserve the gift. I mean that you have been saved by grace through believing. You did not save yourselves; it was a gift from God. 9 It was not the result of your own efforts, so you cannot brag about it. 10 God has made us what we are. In Christ Jesus, God made us to do good works, which God planned in advance for us to live our lives doing. – Philip Yancey, What’s So Amazing About Grace? So do you think we should continue sinning so that God will give us even more grace? 2 No! We died to our old sinful lives, so how can we continue living with sin? 3 Did you forget that all of us became part of Christ when we were baptized? We shared his death in our baptism. In simple terms, Grace is a free gift from God, given to those who will accept it. There are no strings attached and there are no conditions that must be met or achieved to receive it. Grace changes the receiver. That change is why Christians do not continue in sin. That does not mean Christians never sin. It means when they sin, they recognize it and ask God for forgiveness. By the way, April 30th is Pay It Forward Day. Have you been changed by Grace? Perhaps you can demonstrate grace to some unsuspecting soul on April 30th. I would love to hear about that.